Elfin Patch: What a Mess. What a mess indeed. I walked into my sewing room yesterday, and decided that no way could I do any sewing till I had tidied, sorted, and put away some of the mess. I am only putting these photos up small as to say the least I am a bit ashamed. You would think that not having a door on the sewing room, only a curtain, would make me keep it tidier. WOW, seeing it in print it looks even worse. Its all because I had lots of odd deadlines, things that had to be posted or delivered etc etc..
Well it is somewhat tidier today, and oh joy, I have found several things that were missing.. The Bee on Wednesday was fun as always, though several were missed as they were on holiday. Its a hand stitching group so lots of stitching, and much cake eating as usual. I took my Daisy Day blocks by Jenny of Elefantz Designs to stitch. 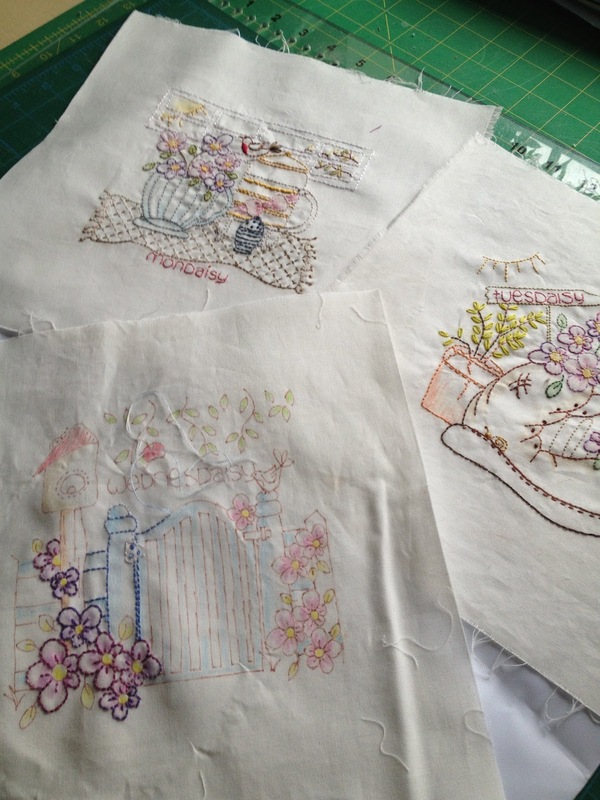 It makes a change to embroider someone else's designs, and not mine and they are so pretty. This week, as I am not sewing until all the mess is all cleared up, I also sorted out my Christmas sock knitting. 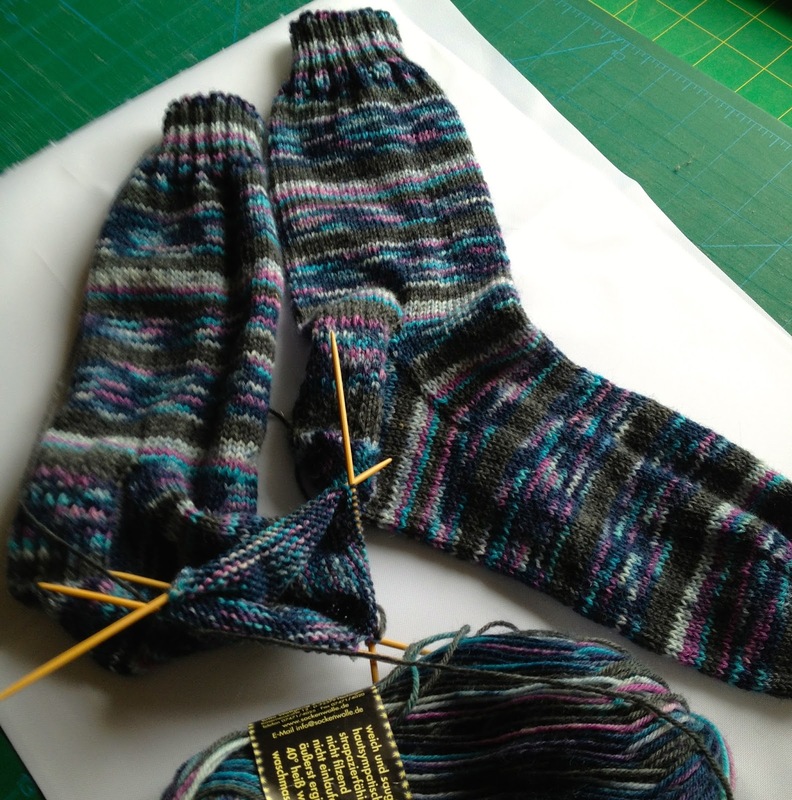 Lots of lovely sock wool purchased and the first pair well on the way. 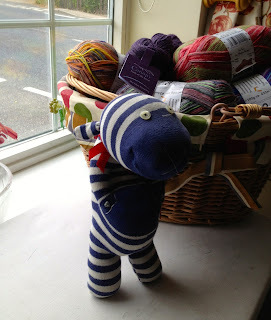 My wool basket looks great and my sock buddy(with attitude), which my daughter made for me many years ago out of an abandoned sock looks well pleased. 1st pair of christmas socks nearly there. I have been following a blog called "square grannie" by a lady called Deborah, who also knits socks as well, and when she photographs them she stands the little cuffs up. They look so cute. I can't seem to do it with mine, they are too floppy. I guess its time to get back to tidying the sewing room. We all need to clean our sewing space before we can start creating something new.